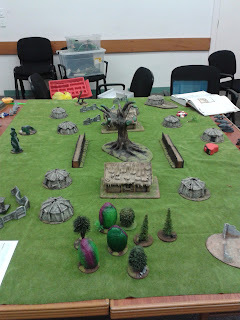 Game two was an aerotech artifact game, were the said aerotech artifact was a huge tree. Some artifact. My force stayed the same, in his he cut some units down to have a unit of warp spiders. 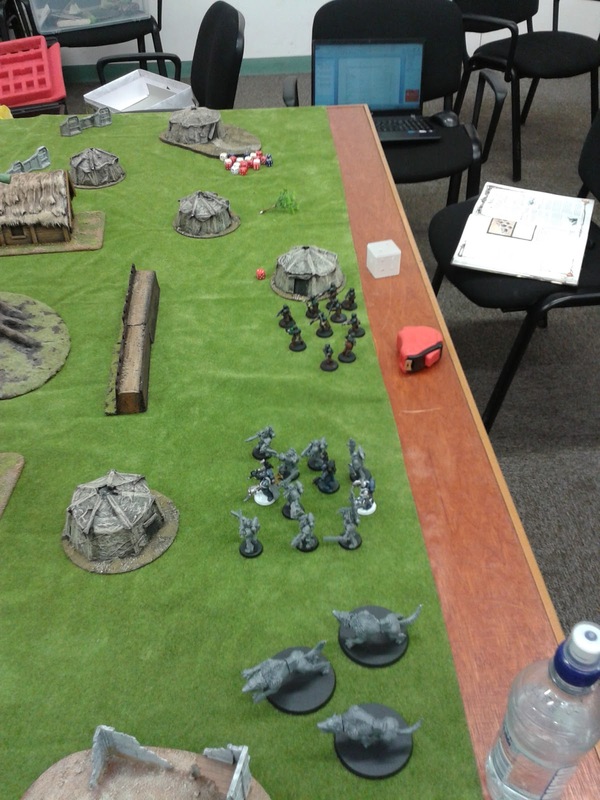 I rolled first for deployment again (and went first as he was unable to steal the first turn) I deployed the bulk of my Grey Hunters behind the wall, with the thunder wolves behind the forest and the rune priest soloing it out of the right flank. 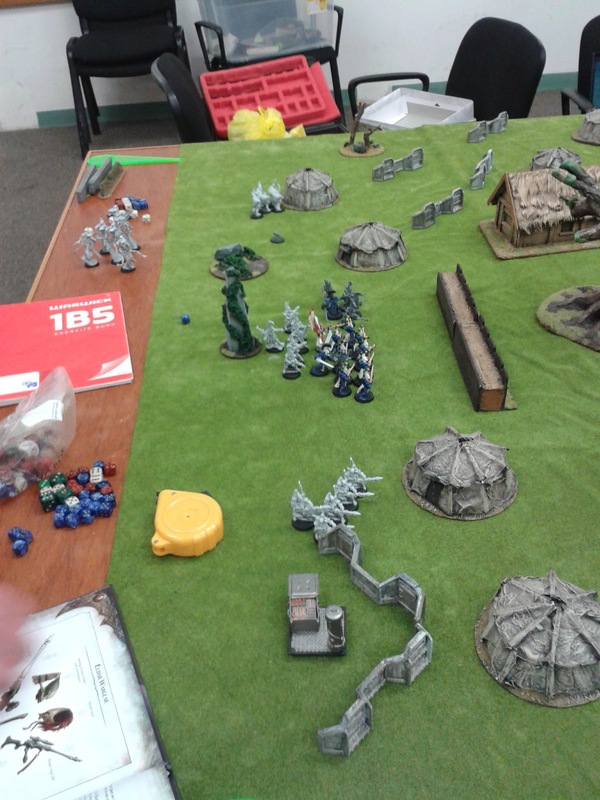 He deployed his forces to macth my own, with most of his troops staring at mine. Overall this game went better than the last. The Thunder Wolves used the forest to cover their advance and pounced on the dark reapers who had moved behind the imperial wall pictured above. The wolves ate them. Whole. The Wolves then consolidated 12 inches towards my opponents table edge ready for more eating. Elsewhere the 2nd Grey Hunter squad stepped up onto the wall and got pinned. 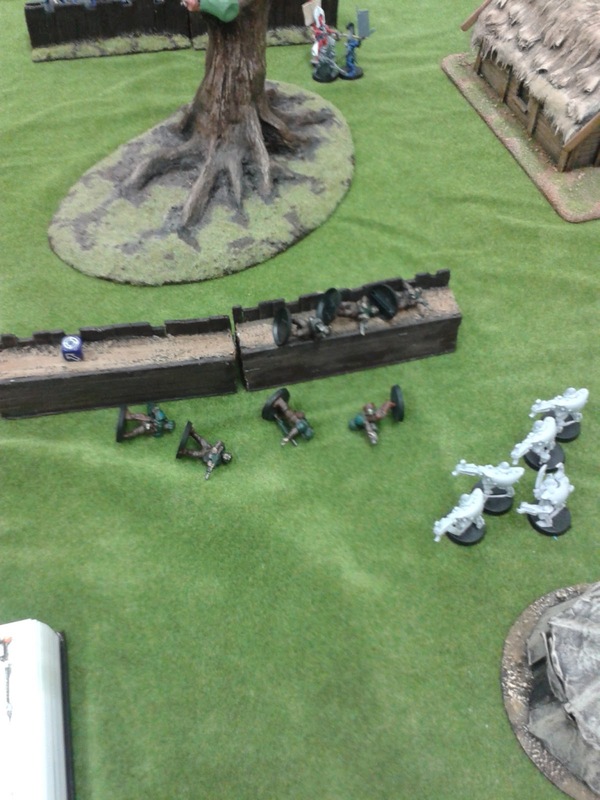 The Rune Priest zzapped some dire avengers and then got warp spidered (official verb for being shot at by warp spiders), who then promptly ran behind the grey hunter squad on the barricade and murdered them. 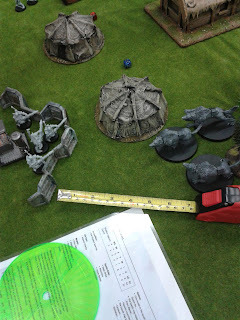 The wolf lord and Grey Hunter squad did nothing the entire game apart from mopeing around some buildings, when the time came from them to do something (charge a fire dragon squad with the eldar Autarch) the failed some very vital rolls and died. 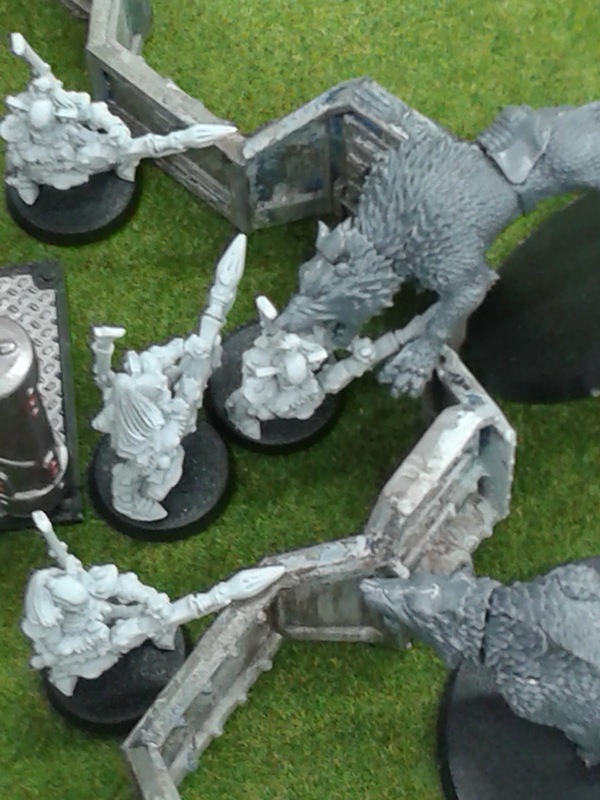 The thunder wolves lost a model when the Shadow specters deep struck beside them, the Thunder wolves then ran and railed the next turn, charged the shadow specters and ate 3. YAAAA. 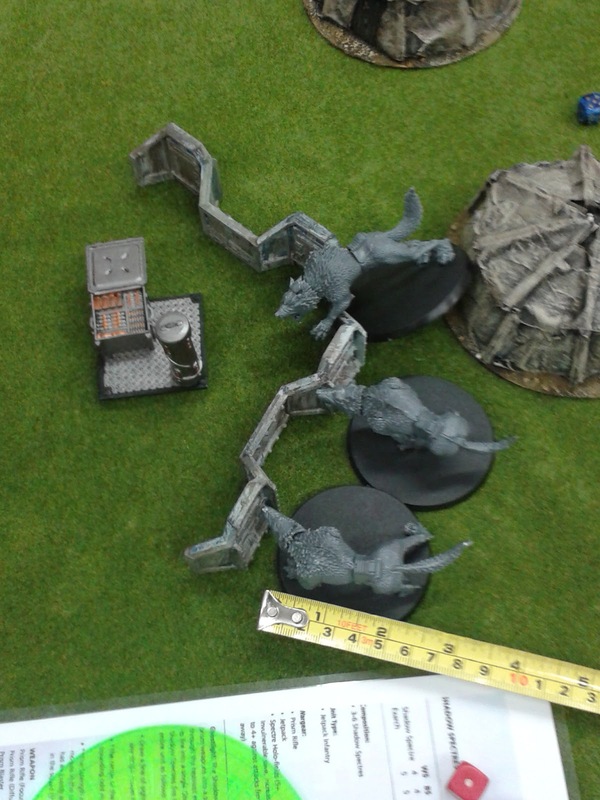 However next turn they died to sheer weight of fire power. Not-so-YAAAA. All in all the second game went far better than the first. The Thunder Wolves justified their points cost (and dollars cost) to me and will probably be a permanent feature in the list. 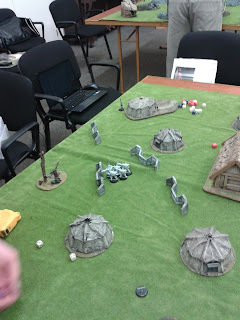 In summary the evening went well for me, I learned some things about my new army, and will hopefully take what I learned and use to win the next game. Next week the Turmakhan campaign for warhammer will resume and hopefully my wood land elves will win a game………….